December is upon us ! Please excuse our lack of posting lately, we have not excuse other than we have been very very busy - which is a good thing ! so, time to catch up - what's new? December brings some new exciting events in our lives, as we add to our regular Sat. Morning Market St. Pete doings, and doing multiple events. We have joined the Pierce Street Market Clearwater family and will be vending there twice a month - next Pierce Street market day is Sat. Dec. 10th. This is a great market, right on the waterfront, downtown Clearwater, right before you go over the big bridge to the beach. Great location, great management and love being a part of something new. Annie will be doing this market, and bringing our popular mini succulents and cacti. Also, we have joined the Sweetwater Farm Market in Tampa as occasional vendors there - our first appearance is this Sunday, Dec. 4th. We are excited to be at this venue, it's a wonderful organic farm that hosts a weekly market with lots of great produce, food and artisans. Coming up this month too, is Sunday, Dec. 18th, when we will be back at the new Thrill Hill Market, in the Old Southeast Neighborhood of St. Pete. Market hours are Noon-5pm. Check out Thrill Hill Market on Facebook. Also, another great event this month is our appearance at the yearly Plant & gift Show at Florida Botanical Gardens in Largo, on Sunday, Dec. 11th. Check out the gardens on Facebook. The show is a popular one, and you must stay for the nightly light show in the gardens ! And yes, Saturday Morning Market, downtown St. Pete, will be open both Christmas Eve day, and New Years Eve day - a great time to get last minute gifts, bring your company from out of town, get great plants, food and have fun in the Heart of St. Petersburg. So, as you can see, it's going to be a busy month and we are very busy preparing lots of great plant specimens for all around great gardening, and special ones for the Holidays. 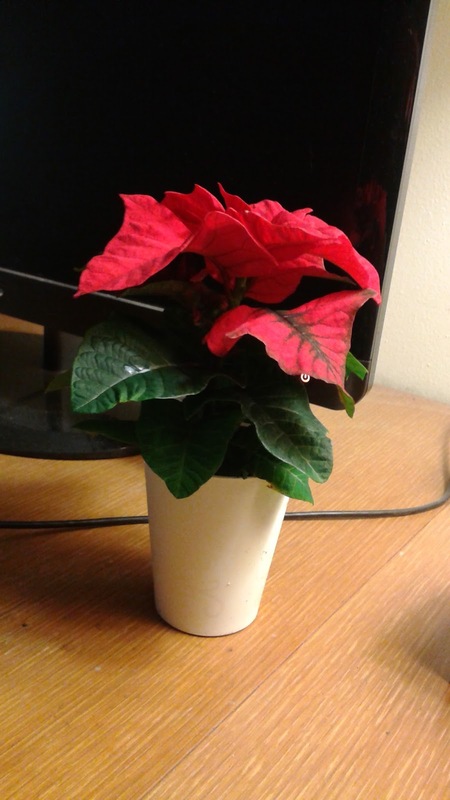 The pic above is an adorable Mini Poinsettia, perfect for home and office, and makes a great gift to someone special. These minis are easy, only requiring once a week watering and they can tolerate the shade of indoors as well as outdoors. We also will have some gorgeous Christmas Cactus at market this month. So, hope you can join us, wherever we are and we look forward to celebrating the Holidays with you. Sat. Dec. 24, Saturday Morning Market, downtown St. Pete - Xmas eve day! Sat. Dec. 31, Saturday Morning Market, downtown St. Pete - New Years eve day !